Home Universities BHU BHU PET 2019 Application Form (Available) : Apply Here! 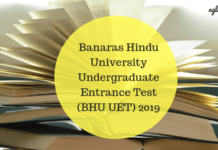 BHU PET 2019 Application Form is reopened for 24 hours for the registered candidates only by the Banaras Hindu University (BHU) online at its official website bhu.ac.in. 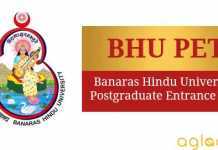 The Application Form for BHU PET 2019 is available for admission to various Postgraduate courses for the academic session 2019 with no age limits set by the university for candidates to apply. BHU is going to organize the Postgraduate Entrance Test 2019 (PET 2019) for which candidates will have to register themselves online on the official website. Candidates who wish to pursue the Master’s degree in Arts (subjects of humanities), Science or commerce, like MA, M.Sc. M.Com. MBA, LLM, etc, can apply for this entrance examination. To get complete information regarding BHU PET 2019 Application Form read the full article. Latest: Application portal is reopening for 24 hours for registered candidates only to complete their application form, check the notice. 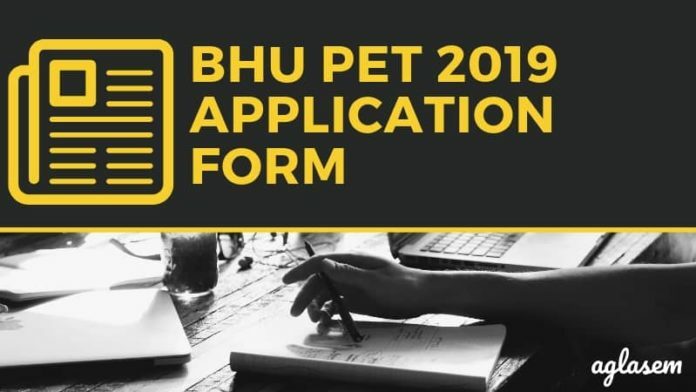 Application form of BHU PET 2019 is available now. Candidates can visit the direct link given below and fill up the application form. The table listed below incorporates all the important events and dates. The table would help the candidates keep a track of all the happenings during BHU PET 2019. Apply Online: Click here to fill the BHU PET 2019 Application Form. Through cash via Challan in any branch of HDFC Bank. Pay the fee in cash at any branch of HDFC Bank through the Challan downloaded from the Entrance Test Portal. You will be able to download the duly filled up HDFC Bank challan from the Entrance Test Portal only when you select the “cash payment” option while filling the application form online. Note: In case the candidate fills up application form for more than one course under PET 2019, the Application Processing Fee or Entrance Test Fee payable by him/her for each after first application shall be charged Rs 300 and Rs. 200 for SC/ST/PWD. On the homepage click on “Apply for Admission”. The candidates will be directed to the registration page, then click on “Register yourself”. Provide the details on the registration form: Email, Mobile number, Name, Date of birth, Gender etc. On successful submission of details, You will receive an e-mail on the e-mail ID provided by you and a validation code on your registered mobile number. This email will contain an activation link. Click on to “activation link”, in order to register successfully. Fill the application form with the required details that are: Personal, Educational and Contact details. Click on to “Save and Continue”. Select centre preferences: The candidate will have to choose 5 centres as per their wish and the one of the which, will be allotted later to them. Candidates will have to upload their scanned passport photo with 3.5 x 4.5 cm dimensions, scanning resolution should be within 100 dpi & file size should be less than 100 KB. Candidates will have to upload their scanned signature with 3.5 x 4.5 cm dimensions, the signature should be done with a Blue/Black pen on a white sheet (for scanning and uploading in “jpeg” format only. File size of the scanned photograph should not be more than 100KB). Candidates can also check the guidelines to fill the application form in English | Hindi. On the dashboard click on to “My application”. The status of the application form will be provided on the screen for the candidate. Age Limit: The university has to set an age limit for candidates to apply for the test. Candidates of any age can apply for admission to the university. M.A – Candidates must have a B.A degree under 10+2+3 pattern or equivalent with a minimum of 50% aggregate marks. M.Com – Candidates must have B.Com under 10+2+3 pattern or equivalent with a minimum of 50% aggregate marks. MCA – Candidates must have BCA degree under 10+2+3 pattern or equivalent with a minimum 50% of aggregate marks. M.Sc. – Candidates must have B.Sc. under 10+2+3 pattern or equivalent with a minimum of 50% aggregate marks. MBA – Candidates must have any graduation degree under 10+2+3 pattern or equivalent with a minimum of 50% aggregate marks.minimum of 50% aggregate marks. LL.M – Candidates must have at least 3 years LL.B after graduation under 10+2+3 pattern or 5 year LLB under 10+2+3 pattern. MABM – Candidates must have passed 4 years B.Sc. (Ag) or equivalent. M.F.A – Candidates must have at least B.F.A degree under 10+2+4 or 10+5 pattern or equivalent with minimum 50% marks. MPA – Candidates must have B.Mus / BPA. Also, candidates can have BA (Hons.) / B.A. under 10+2+3 pattern with a minimum of 50% marks in music practical. Other special exams are also included. M.P.E.d – Candidates must have at least Bachelor of Physical Education or 4 years of Physical Education (professional) degree with minimum 50% marks. M.Lib.I.Sc. – Candidates must have any graduation degree under 10+2+3 pattern or equivalent with minimum 50% marks. M.Ed. – Candidates must have at least 50% marks or equivalent grade in any of the following programmes: B.Ed, B.A. B.Ed., B.Sc. B.Ed., B.El.Ed., and D.EL.Ed., with an undergraduate/post- graduate degree with at least 50 % aggregate in each or any equivalent. The admit card for BHU PET 2019 will be made available online on the official website for candidates who will apply successfully for the test. It should be made clear that only a notification regarding the availability of the admit card will be sent to the candidates through SMS or Email, no candidates will receive the admit card b post under any condition. BHU is the key abbreviation for Banaras Hindi University. It is most prominent Univeristy which was founded in 1916 for the purpose of establishing the high standards of the education for those who aspire to continue with it. BHU grants admissions in various UG and PG courses on the basis of the entrance exam, every year. Those candidates who qualifies the exam then shortlisted for further admission rounds. are bhu pet 2019 application form released yet? it will be released soon, kindly stay connected.